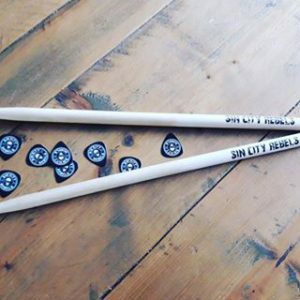 A drummer can't drum without his own printed drumsticks with their own name or logo. Order your own drum sticks very easily using the form. Of course also nice to give as a gift to someone! You can select from these drumsticks: 5A, 7A, 5B and 5AN. We also have Vif Firth and ProMark drumsticks in 5A and 5AN. The two lines you see are the drumsticks. On the bottom is the placement where we can print. A drummer can’t drum without his own engraved drumsticks with their own name or logo. 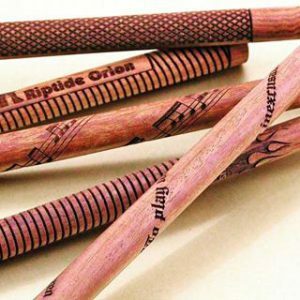 Order your own drum sticks very easily using the form. Of course also nice to give as a gift to someone! You can select from these drumsticks: 5A, 7A, 5B and 5AN. We also have Vif Firth and ProMark drumsticks in 5A and 5AN. The two lines you see are the drumsticks. On the bottom is the placement where we can engrave.